Does this MIP2C4 component look healthy? Why is there a dark spot around it? As an aside: I've tried finding the datasheet for it to see if I can easily test it, however I can only find Chinese PDFs. It looks to me like some liquid soaked into the board and has entered the board via the holes for components. You can see it to a lesser extent around other holes in the board. The board looks fine, although the chip does look to have been getting warm - but that could be normal. One easy thing to check is the 270K resistor next to it, that 'may' be a start-up resistor, and 270K is in the range that's likely to fail (going high or O/C). I would also suggest checking for any S/C diodes or high ESR electrolytics. Only then try changing the chip, if you can source one. How did you go with the repair ? Often, with these power supply boards I would just replace all the output electrolytic capacitors with "quality" low ESR types. The output capacitors are heated internally by ripple current, some significantly. Any warm/hot diodes close by will add to that heat stress. Generally the low volt ones fail first or near a hot diode, sometimes visually evident. Check the old ones for confirmation. 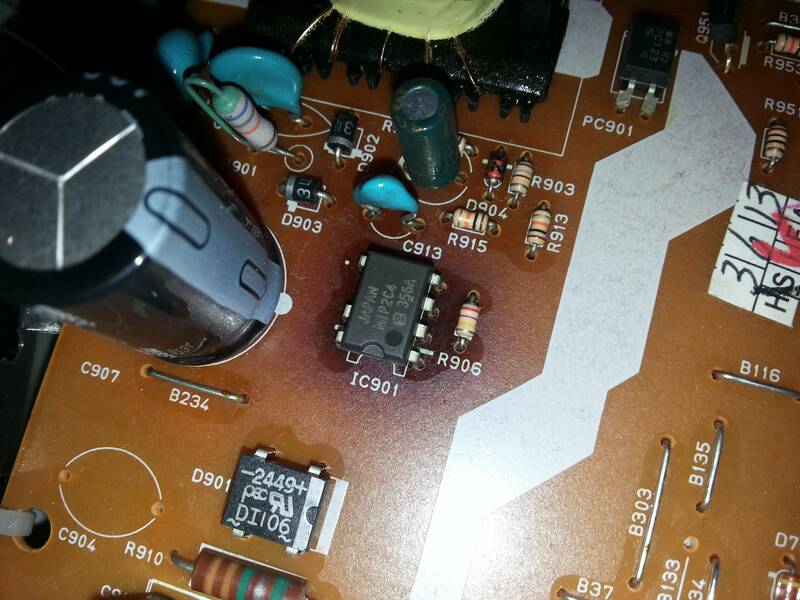 The " dark spot" around IC901 is overheat of the pcb, it is quite common in consumer equipment power supplies, you might see it near some diodes as well. It is due to less than good thermal design for the ambient operating temperature, & is made worse by leaving unit on 24/7. If you get it running again, stick on a small ceramic heatsink (DON'T use metal ! ), this should help IC901 heat dissipation. Hopefully you should get another 5 years use. This board was not washed sufficiently after soldering. wash it with hot propynol. One problem with DVD players is the life of the laser is not long. When the laser dies you buy a new DVD player. The symptom is skipping and drop outs. I put a fan through the case to cool the laser. You can buy one at goodwill for ~$11.00 and put a fan in to cool it. You also have to blow out the dust periodically. It's an LCD power supply chip. Try looking at the datasheets for TNY266PN or NCP1010-14 ; they might have similar pinouts, etc.